New data released by the Czech Statistical Office suggests that unemployment in the Czech Republic is at an all-time historic low. The unemployment rate in the Czech Republic declined in the fourth quarter of last year to 3.6 percent, the lowest level in the history of the country. The employment rate (calculated as the share of employed persons in the age group 15–64 years as a percentage, seasonally adjusted), reached 72.9% in December 2016, increasing by 2.1 percentage points as compared to December 2015. The data pointed to some interesting social trends: the male employment rate was 80.0%; the female employment rate was 65.6%, both seasonally adjusted. Other notable patterns included increases in self employment and entrepreneurship. The employment rate of persons aged 15–29 years, seasonally adjusted, was 48.1%, in the age group 30–49 years it was 87.5%, and in the age group 50–64 years it reached 70.6%. In the Czech Republic, the age group 65–74 years is characterized by a low number of unemployed persons and therefore there was a slightly lower general unemployment rate in the group 15–74 years of age, which was 3.5% in December 2016. Numbers for the Czech Republic are based on monthly data from the Labour Force Sample Survey. 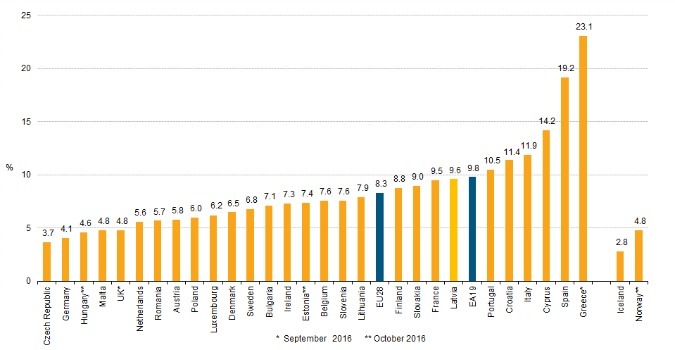 The Czech Republic remains the country with the lowest unemployment rate in the EU, according to figures released by Eurostat in January 2017. Czech economist Petr Dufek told iDnes.cz that employment growth and the continued shortage of new workers would likely mount pressure for employers to increase wages in the future.